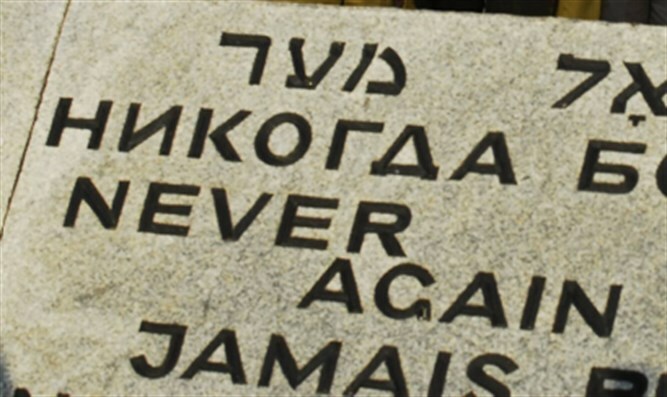 Monument to Jews enslaved by Hungarian Fascists and murdered by Nazis destroyed. A monument in Hungary commemorating Jewish slave workers later murdered in the Holocaust was defaced. At least three marble plates signifying Jewish headstones were smashed Sunday in Balf, a town located 120 miles west of Budapest, the Jewish weekly Szombat reported Monday. A government spokesman issued a “strong condemnation” of the act, which police are investigating. There are no suspects. The monument, which comprises dozens of marble tablets in the shape of headstones, was unveiled in 2008. The positioning of the headstones evokes a group of people walking – meant to honor the memory of those forced to work there by pro-Nazi Hungarians before they were murdered. Those commemorated in the monument are victims of what the Yad Vashem Holocaust museum in Jerusalem calls the death marches of Hungarian Jews through Austria in the spring of 1945. The previous year, Hungarian Interior Minister Gabor Vajna pledged to provide the German Reich with 50,000 Jewish men and women as slave laborers. By 1945, Hungary’s fascist Arrow Cross handed over 76,209 Jews to the Germans “on loan” until the end of the war. After an arduous march from Budapest at the height of winter, in which thousands died, the survivors arrived in a weakened state to the border and were handed over to the Germans. Some were forced to dig trenches, other to build structures. Of the 35,000 Hungarian Jewish forced to work in the Lower Danube Gau area, a third died of starvation, exhaustion and diseases. To prevent the spread of epidemics, Nazi guards would shoot anyone suspected of being ill.